This blog is all about Red Hat Enterprise Linux 6. It contains all information about RHCE, RHCSA and System Administration. In this blog you will find all questions related to RHCSA and RHCE exam objectives and also all day to day system administration tasks. Pawan Sharma | September 12, 2011 | Disk Partitioning | RHCSA Objectives Be the first to comment! Partitioning is a very important concept in Linux. If you have your concepts clear, related to partitioning in Linux, it will be very helpful when you became a Linux System Administrator. There is a new partitioning tool RHEL6 cfdisk, but we will see the traditional and most popular partitioning tool "fdisk". To use fdisk first you have to login as root. if you are a regular user and know root password, you can switch to root account using "su" command. In the above image you can see that I have two hard disks. The first one is /dev/sda and the other one is /dev/sdb. In the above image you can see that the HDD /dev/sda is of size 16 GB and having two partitions /dev/sda1, which is created at the time of installation as /boot, and /dev/sda2, which is a Linux Logical Volume Manager(LVM). The second HDD is /dev/sdb which is newly installed HDD of size 2 GB and does not contain any valid partition table as you can see in the image. In this post we will create the physical partitions and mount them on particular directories. 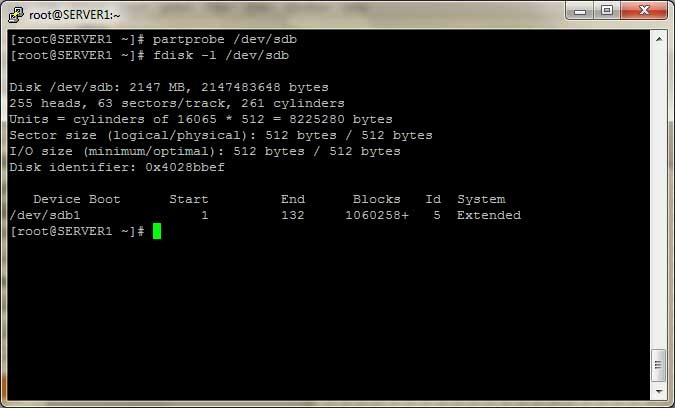 To create a partition of 1 GB form /dev/sdb type :fdisk /dev/sdb, and press m to see menue. Press n to create new partition, p to create primary partition and e to create extended(always create first partition as primary), make partition 1, select first cylinder as default and on next line type +size of partition to be created,ex +1G. Now press p to print current partition table and press w to save partition table. 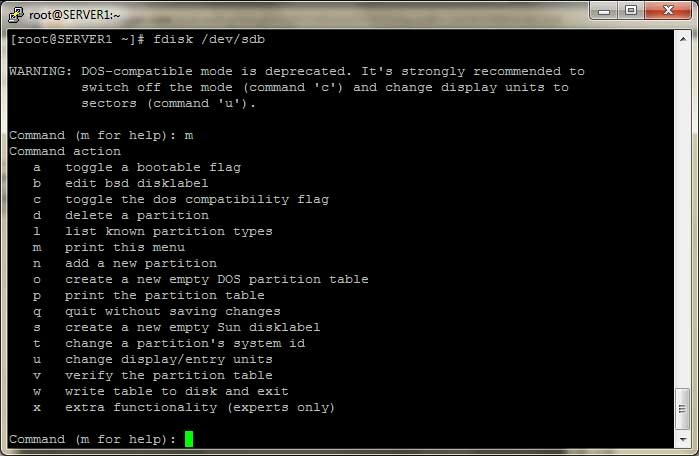 and on command prompt type partprobe to update current partition table and run fdisk -l /dev/sdb. 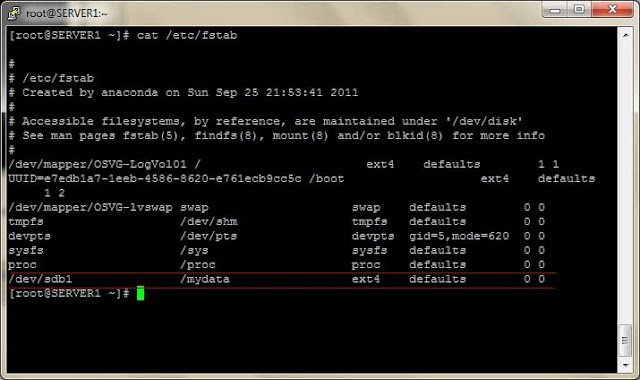 Now format this partition with command : mkfs.ext4 /dev/sdb1. Then create a directory /mydata, and mount /dev/sdb1 on /mydata using command : mount /dev/sdb1 /mydata. Make entry in /etc/fstab to make mounting persisting, means mount /mydata every time when server restart. In next post we will learn how to create partition using Linux Logical Volume Manager(LVM) . Please comment if you have any doubts.